Books, Photograph, Painting, Music, Video, Website, Mobile App, etc. Copyright, a form of intellectual property law, protects original works of authorship including literary, dramatic, musical, and artistic works, such as poetry, novels, photograph, Painting, a speach, movies, songs, source code of a software program, the binary executable file, Website, Mobile App, and architecture. It registration with IPR Authority essentially ensures that any creative work cannot be copied without the permission of the author or creator. This allows the author to charge others for copying his work, or modifying it, or building on top of it. For example, downloading an image from Shutterstock and using it on your own website without purchasing or taking on rent is violating the copyright of Shutterstock. Shutterstock can file a suit against you to claim its value of the image. By Registering your work, basically you wanted to protect your right over that and some sort of earning by letting it to others for using. Copyright registration creates a public record of the ownership by copyright holder. Enables the owner of the copyright to take legal action against infringers in a court. Any legal action taken before or within a certain period from the date of publication, then adequate evidence can be presented in court relating to the validity of the copyright the facts that are stated in the certificate of copyright. In case registration is made within a short span of time the person’s work or at any time prior to the infringement of the copyrighted work, the copyright owner is permitted to claim statutory damages in a high court. Copyright gives the right to use, re-use, reproduce the copies and can sell the copies. By copyrighting one can import or export whole or part of work. Owner is free to create any derivative work and can demonstrate it publicly. Work can be indulged in transmitting or displaying it by radio or video. Copyright, therefore, encourages enterprise and enables an encouraging climate to motivate economic activity. Enables moral rights to be identified as the creator or the author of definite kinds of material (known as the paternity right), and can raise any objection to the distortion and mutilation of the right. Application for registration is to be made on Form XIV ( Including Statement of Particulars and Statement of Further Particulars) as prescribed in the first schedule to the Rules. The applications should be signed by the applicant. The Power of Attorney signed by the party and accepted by the advocate should also be enclosed, if applicable. Once the application approved, Registration Certificate issued. This complete process takes atleast 2 to 3 months by department in normal course. Our Copyright Experts give on call consultation to client first to make him clear about the process of registration with authority and Documents requirement. Our Copyright Expert prepare your application. We co-ordinate with you for all the copyright documents. As soon as your documents reached to us and your application is processed properly, our expert then file your copyright application online as well as physically as and where required to be filed along with fee. On successfully filed Dairy note ( acknowledgement no.) is issued to to you immediately. You can check your application updated status online. Once your application approved, Registration Certificate issued. This complete process takes atleast 2 to 3 months by department in normal course. We deliver Certificate to you immediately. Class & Description of Original Work. Rights of copyright owner under copyright act 1957? *Work Awaited: Work yet to be received.? *Waiting: Payment Accepted,Application in mandatory waiting period of one month(Copyright Act 1957).? *Documents not received, formality check failed: Documents/works not received only after making payment. ? *Abandoned: Documents/works not received after filing.? *Scrutiny: Application is under process.? *Discrepant: Application is not in complete format a letter will be sent to you by Registered Post.? *Re-Scrutiny: Application is under process again with Reply sent by you.? http://copyright.gov.in/ is Copyright Registrar Website in India. Click on 'Status of the Application" or "http://copyright.gov.in/frmStatusGenUser.aspx"
You can find the updated status. The Copyright Act, 1957 protects original literary, dramatic, musical and artistic works and cinematograph films and sound recordings from unauthorised uses. Unlike the case with patents, copyright protects the expressions and not the ideas. Can I protect my Ideas, Procedures, Methods or Mathematical concepts under Copyright Act, 1957? The Copyright Office has been set up to provide registration facilities to all types of works and is headed by a Registrar of Copyrights and is located at Plot no. 32, Boudhik Sampada Bhawan, Sector 14, Dwarka, New Delhi- 110075. The applications are also accepted by post. On-line registration through “E-filing facility “ has been provided from 14th February 2014, which facilitates the applicants to file applications at the time and place chosen by them. Where to Submit Physically Copyright application? Plot no. 32, Boudhik Sampada Bhawan, Sector 14, Dwarka, New Delhi- 110075. The applications are also accepted by post. Yes. Both published and unpublished works can be registered. Copyright in works published before 21st January, 1958, i.e., before the Copyright Act, 1957 came in force, can also be registered, provided the works still enjoy copyright. Two copies of published or unpublished work may be sent along with the application. If the work to be registered is unpublished, a copy of the manuscript has to be sent along with the application for affixing the stamp of the Copyright Office in proof of the work having been registered. One copy of the same duly stamped will be returned, while the other will be retained, as far as possible, in the Copyright Office for record and will be kept confidential. It would also be open to the applicant to send only extracts from the unpublished work instead of the whole manuscript and ask for the return of the extracts after being stamped with the seal of the Copyright Office. Yes. Computer Software or programme can be registered as a ‘literary work’. As per Section 2 (o) of the Copyright Act, 1957 “literary work” includes computer programmes, tables and compilations, including computer databases. ‘Source Code’ and “Object Code” have also to be supplied along with the application for registration of copyright for software products. A website may be understood as a webpage or set of interconnected webpages, hosted or stored on a server, and is made available online to members of public. Users can access the information and other underlying work on a website through various means such as scrolling webpages, using internal hypertext links or a search feature. How can I get Copyright registration for Mobile App? A Mobile App is a complete, self-contained computer program that is designed to perform specific tasks. Usually called 'Apps' for short, application programs are the most familiar forms of software and come in a very wide variety of types. An App usually has primarily dynamic content and is designed for user interaction. It may be used directly or indirectly in a computer or hand held electronic device. After you file your application and receive diary number you have to wait for a mandatory period of 30 days so that no objection is filed in the Copyright office against your claim. In case any objection is filed, the Registrar of Copyrights after giving an opportunity of hearing to both the parties, may decide to register the work or otherwise. As per the rule 70(12) of the Copyright Rules, 2013, an opportunity of hearing must be given. However, only after hearing, it may be decided to register the work or to reject it. The applicant himself or his/her pleader may appear in the hearing. Whether certificates qualify to be copyrightable subject matter? Originality is considered as ‘the bedrock principle of copyright’ and ‘the very premise of copyright law’. A work to be a copyrightable subject matter is to be created by the exercise of labour, skill and judgment of the author. Also, such exercise of efforts on the part of the author should not be trivial in nature and thus should not be a mere exercise of the mechanical function of copying the work of another. Variation must be substantial in nature than merely trivial thus requirement of degree of originality is quantitative in nature. What rights are available to copyright author under copyright act? 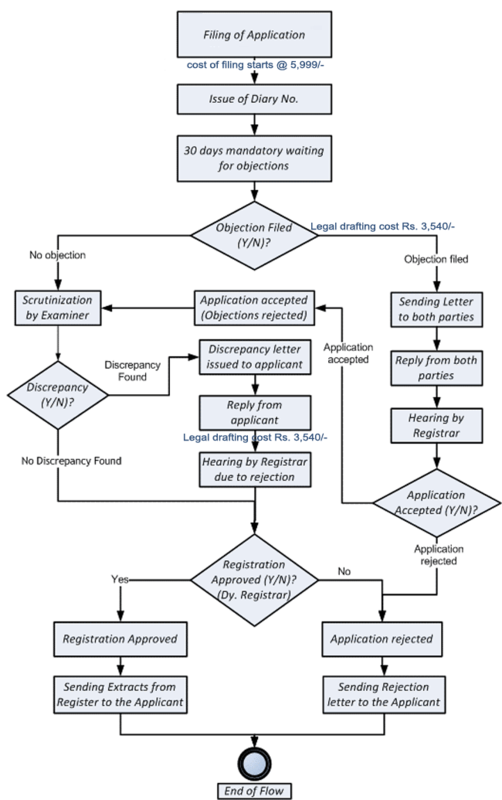 How long is the registration of a copyright valid in India? Generally, the copyright registration is valid for 60 years. Is it possible to register a work in Join Name of two person? Can I sell or Transfer my Copyright to another? A copyright of work is an intellectual property, which can be sold, transferred, gifted and franchised. Is my copy right registration in India valid globally? No. A copyright is valid in India only. However, if you have filed a copyright in India, you can use this as evidence before any government to prove that you were using the copyrighted content first. How to search the copyrighted work? Is there any platform available? Unlike a trademark, no platform is available to search the registered copyright. You can only do a proper research on the Google and try to findout if available on internet through any source or postings. What if someone uses my creation when my copyright application is under process? You have a protection even if your copyright application is under process. You can immediately take a legal action, send a legal notice to the second party regarding the same. If still, the problem remains unsolved, you can file an infringement case in the court against the person. What is the difference between copyright assignment and copyright license? In copyright assignment, the owner transfers the rights over the creation. The owner left with no rights over the work unless the transferee re-assign the copyright to the owner. In copyright license, the owner licenses the right to use the copyright but retain the interest in the copyright ownership being licensed and in exchange, the owner gets a royalty. Can I myself file an application for registration of copyright directly? Yes. Any individual who is an author or rights owner or assignee or legal heir can file application for copyright of a work either at the copyright office or by post or by e-filing facility from the copyright Office web-site "www.copyright.gov.in"
HOWEVER, it is advisable to take the help of consultant to avoid any mistake. How to Pay Fee for copyright registration?